The present volume of Fossilium Catalogus slowly emerged from my work on the stratigraphy of the Valanginian and the Lower Hauterivian and evolved in the database ‘Ammonite’ which was developed over the last ten years. During my work on ammonite stratigraphy I discovered the major diversity of ammonite literature: in many languages, from all parts of the world, often obscure, little known or entirely unknown. Starting point for my search was the ‘Synopsis des ammonites néocomiennes (Infravalanginien (Berriasien) – Aptien (incl. ))’ of SIMIONESCU (1900). In this publication he presents for the Lower Cretaceous (except for the Albian) from 175 sources about 900 species in 41 genera. After a century the amount of names for species and genera has to my estimation increased tenfold. Intention of this work is to give current and future researchers an overview, as complete as possible, of genera, species and types of Lower Cretaceous ammonites with the corresponding literature. This survey can be important as a tool for the work on the actual problems like the definition of the Jurassic-Cretaceous boundary, the definition of the boundaries between (sub)stages of the Lower Cretaceous and the definition of (sub)zones in the Lower Cretaceous. There are Lower Cretaceous ammonites used as zone marker whose concept is not agreed on by the specialists. Hauterivian zone ammonites are presented without acceptable revision, without lectotype, without proper knowledge of the variety or their stratigraphical range. We find nomina nuda of species that lead their’s own life in literature and are used as markers for stratigraphical units. Geologists copy for decades lapsis calami of ammonite names. Dates of publication of ammonite species are often a source of confusion. - the first zone of the Barremian, the Hugii Zone was introduced by BUSNARDO (1984) and defined by HOEDEMAEKER & BULOT (1990) as the biostratigraphic interval between the first appearance of Taveraidiscus hugii and that Kotetishvilia nicklesi. But the definers had another concept of the T. hugii in mind then the official one. They overlooked the designation of TZANKOV (1935) of a lectotype and overlooked also the publication of AVRAM & KUSKO (1984) in which the designation was clearly indicated. So the boundary of the Hauterivian and Barremian is yet not clearly defined and waits on the revision of Taveraidiscus hugii (HOEDEMAEKER et al., 2003). - the ammonite Neocomites (Varlheideites) peregrinus RAWSON & KEMPER was promoted to the index of a zone in the Upper Valanginian in the standard ammonite zonation for the Lower Cretaceous Series by HOEDEMAEKER et al. (2003), found for the first time in Germany at one unique place in a quarry and described by RAWSON & KEMPER (1978). This species was after 150 years of research only recently recognized in France in 1989 (AUTRAN) and in 1997 in Spain (KLEIN) in spite of the fact that this species is very abundant in both countries. So a lot of research has yet to be done to lay the base for a solid Lower Cretaceous ammonite standard zonation for the Mediterranean region. A good example of an approach is given by MARIA AGUIRRE-URRETA and PETER RAWSON (1995-2002) who systematically revise the Lower Cretaceous ammonite fauna from the Neuquén Basin in Argentina, which enables them to set up a solid ammonite zonation for that part of the world. This systematic approach is also the intention of the IUGS Lower Cretaceous Ammonite Working Group, the ‘KILIAN Group’, part of the IUGS Subcommission on Cretaceous Stratigraphy, a group of specialists from all over the world, which work both individually as collective on these topics. ‘The aims of this group are to construct a standard ammonite zonation for the Lower Cretaceous Series, which is in fact the zonation for the Mediterranean Faunal Province, where all Lower Cretaceous stages except the Albian, were defined; to develop ammonite zonations for other key areas in the Tethyan, Boreal and Austral realms and to calibrate them with the ‘standard”; and to recommendate on the definitions of Lower Cretaceous stage and substage boundaries to the appropriate stage working groups of the 'IUGS Subcommission on Cretaceous Stratigraphy' (HOEDEMAEKER et al., 2003). 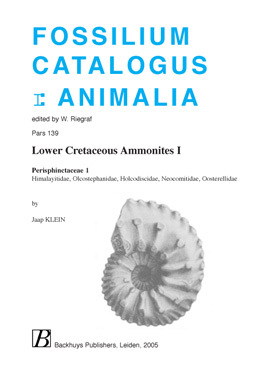 In the last part of the Fossilium Catalogus Lower Cretaceous Ammonites a revision will be take on the names of genera and species in ammonite standard works from the 19th century and the beginning of the 20th century like D’ORBIGNY, PICTET, BAUMBERGER, UHLIG and VON KOENEN. This part will also conclude with an overview of the stratigraphy of Lower Cretaceous ammonites (specified as refined as possible in stages, zones, subzones or horizons) and with the actual correlation of the ammonite (sub)provinces in the world. The following groups are in preparation: the Polyptychitidae (Perisphinctaceae 2), the Ancylocerataceae, the Phyllocerataceae, the Lytocerataceae & the Tetragonitaceae, the Haplocerataceae, the Desmoceratacea and the Pulchelliaceae.